Researchers demonstrated a 3x improvement in electron mobility of epitaxial graphene (and similar improvement in radio-frequency transistor performance) by adding hydrogen to the Graphene. 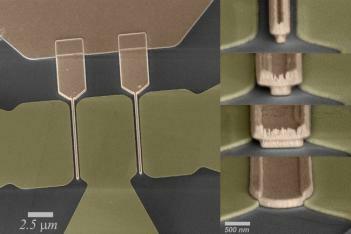 They reported an extrinsic cut-off frequency of 24 GHz in transistor performance, the highest reported so far in a real-world epitaxial graphene device. The hydrogenation technique involves turning the buffer layer into a second, free-floating one-atom-thick layer of graphene by passivating dangling carbon bonds using hydrogen. This results in two free-floating layers of graphene. An additional process step fully converts the buffer layer to graphene. With this hydrogenation technique, the epitaxial graphene test structures showed a 200-300% increase in carrier mobility, from 700-900 cm2/(V s) to an average of 2050 cm2/(V s) in air and 2375 cm2/(V s) in vacuum.